FY 2017 Draft CAPER Available For Comment - Arundel Community Development Services, Inc.
Arundel Community Development Services, Inc.
ACDS is pleased to provide Anne Arundel County’s draft Consolidated Annual Performance and Evaluation Report (CAPER) for Local Fiscal Year 2017 for public comment. This report describes the County’s housing and community development accomplishments for the year ending June 30, 2017. 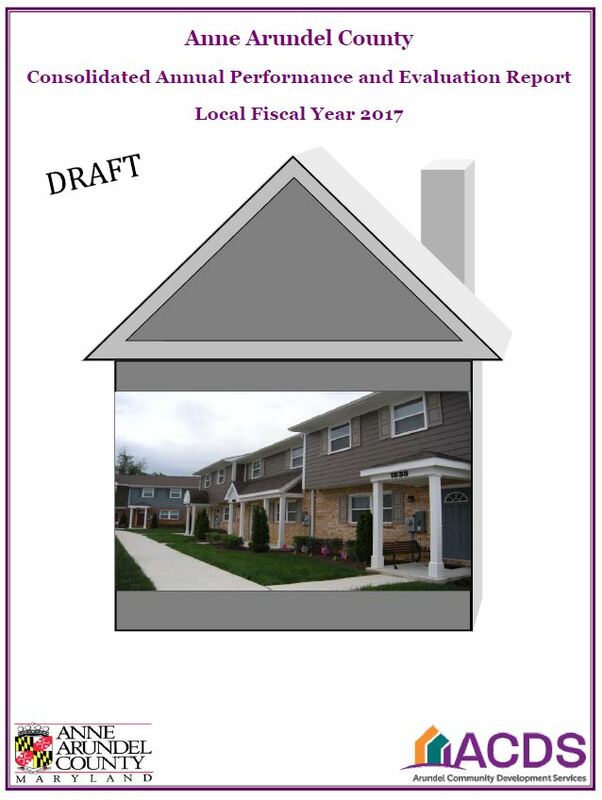 The report describes how Community Development Block Grant (CDBG), HOME Investment Partnerships, Emergency Solutions Grant, Housing Opportunities for Persons with AIDS, Continuum of Care program funds, and County and State housing funds were deployed to meet the housing and community development goals identified in the County’s Consolidated Plan: FY 2016- FY 2020. Public comments should be submitted via email to ebrush@acdsinc.org or via post to ACDS, 2666 Riva Road, Suite 210, Annapolis, MD 21401 on or before September 25, 2017. Oral comments can be submitted by calling 410-222-7600 and asking to be connected to a member of the planning team on or before September 25, 2017. Oral and written comments received by or before September 25, 2017 will be considered and changes made, if such changes are deemed appropriate, prior to submitting the final plan to HUD on September 28, 2017. A summary of all comments, with reasons provided for any comments not incorporated, will be included in the CAPER submitted to HUD.